What is Career Planning and Development? Career planning is the process of taking stock of one’s interests, abilities, principles and personal desires in order to effectivelyreach career goals. A variety of methods are used to create a path for future success. A key to knowing “where to go from here” is to observe the possible learning opportunities available and to determine if the current employment fits with life situations and future goals. Once goals are selected individuals formulate an action or learning plan that when implemented should put them in view of their desired objectives. These plans are developed with many factors in mind. Personality, education, salary requirements, natural ability or skill, etc. When done properly Career Planning and Development could mean the difference between living pay check to pay check or sustaining a satisfying and life changing career. Career Planning and Development is ongoing. It involves continuously editing work and learning plans to help steer the changes that occur in life. By definition Career Planning and Development can be utilized at every career stage. The Career Planning and Development Certification course by Brainmeasureswill explain all the components of career planning. This online certification course will instruct participants on how to maximize their potential and make adjustments to areas that are lacking. For many in the work force, the prospect of changing careers can be daunting but this course will provide the skills and confidence necessary to make good solid decisions about careers and education. In the competitive world that is the workforce a simple thing such as confidence cannot be ignored. True confidence usually accompanies knowledge. When we don’t know our subject we become hesitant and hopeless but often-times success is wrapped up in knowing what to do and how to do it. Brainmeasures is an ISO certified leading online certification provider renowned for their world class teaching standards and skill testing. After getting enrolled in this course by Brainmeasures, you will receive an E-book that will guide you and prepare you for the online exam. Upon successful completion of the exam, you would be awarded the certificate by Brainmeasures. If someone were to become a professional career planner they could make an average salary of $43,000. Salaries in these job roles ranges from $40,000- $80,000. The Career Planning and Development certification course by Brainmeasures is advantageous for all the individuals who need education from a professional on how to plan for success and develop a solid and healthy career. The information participants receive through this course is invaluable. Quite often job candidates are turned down for fixable offenses such as ineffective resumes, or inappropriate attire at the interview or simply not knowing what they want and how to achieve it. By taking this course, future professionals are ensuring that they are making well-formed plans, taking steps towards their goals and starting the race slightly ahead of that pack with the possibility of earning their dream job. Certifications by Brainmeasures are of a very high quality and are recognized and accepted worldwide. 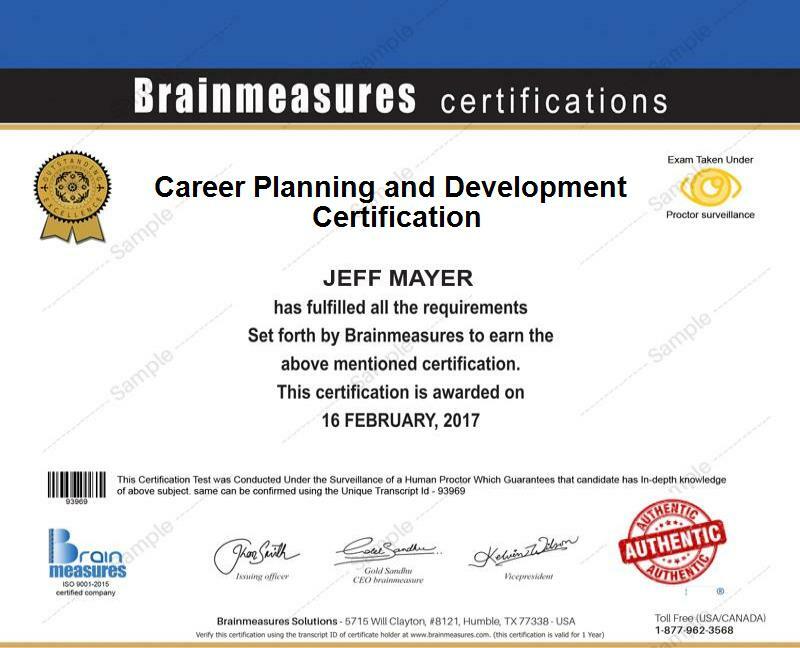 Brainmeasures is an established and famous certifications company well known for their expert teaching guidance and well-designed courses. People who are determined to reach their goals will benefit from the lessons in this course that can be applied throughout their careers.